The mission of HOPE is to empower persons to live independent, non-violent lives through the provisions of Housing, Outreach, Prevention, and Education. In the 1970s, Koralie Murad, a Charleston resident, made a decision. She was leaving her abusive partner. Soon after, she began to recognize the pervasiveness of domestic violence in families around her. Koralie became a friend to a number of women who were being abused by their own partners. Realizing that she could do more than be a friend to other women, she envisioned a safe home that could provide safety and shelter to women in danger. It was in 1978 when Koralie teamed up with Louise Jackson, an instructor in Eastern Illinois University’s Psychology Department. Having completed an independent study with Jackson on the need for a facility to protect abused women in Coles County, Koralie pushed forward with her project. In 1979, the Coles County Task Force Against Domestic Violence was formed and a year later, the group changed its name to Coalition Against Domestic Violence and became structured as a non-profit organization. Funded by the Charleston Township, the CADV program was initially comprised of a two-bedroom apartment. Unfortunately, demand from more victims quickly dictated that the CADV grow their program. The shelter was subsequently moved to a four-bedroom house and, in 1985, the CADV’s Board of Directors acquired a permanent location. HOPE strives to develop program that eliminate barriers victims face. This approach enables us to be flexible in meeting the needs of our clients. 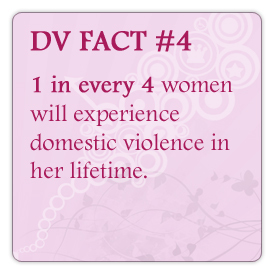 A major step in program development occurred in 1994 with the passage of the Illinois Domestic Violence Act. This law provided civil remedies to victims through an order of protection. The IDVA also established confidentiality provisions for victims and services for their children. As a result, HOPE began developing children’s programs including group and individual counseling. In 2004, we added a therapeutic summer recreation program for kids. Another example of our flexible approach occurred in 2001 after observing the trend of homelessness amongst battered women. Homeless services in Coles County were overwhelmed with victims and their children. In April 2001, CADV was expanded to provide homeless shelter, transitional, and prevention services and took on the name HOPE; Housing, Outreach, Prevention, & Education. The seven rural counties served by HOPE compose six percent of the landmass (acreage) of the state of Illinois. Our concern had always been that victims in the outlying counties did not have adequate access to services. In 1999, we established a satellite office in Paris Illinois to serve Edgar and Clark Counties. Today, HOPE maintains two housing programs: the domestic violence emergency shelter and ten transitional housing through local apartments. The emergency shelter can house up to 24 women and children. The mission of HOPE includes not only Housing, but also Outreach, Prevention, and Education. Toward this end, HOPE offers a host of programs aimed at decreasing violence in our community. 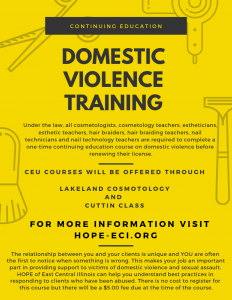 These programs range from outreach educational efforts in the local schools to referrals and counseling designed to empower victims to lead self-sufficient, safe, and successful lives. Though the location of HOPE’s shelter is kept confidential, anyone wanting services can visit the business office at 1927 18th Street, Charleston, the office is open 8:00 a.m. to 4:00 p.m., Monday through Friday. HOPE also maintains a 24-hour, 7 day a week, 365 day a year toll-free crisis hotline providing support, intervention, information, and referrals. 1-888-345-3990.